The Zlín town hall was first mentioned in 1569, at which time it was a single-storey building on the west side of the square. It was newly constructed in 1586 in the Renaissance style, and one of its wings was used as an inn. In 1920, a competition to design a new Zlín town hall was announced. The winner was Zlín architect František Gahura. Shortly afterwards, on 27 August 1921, the original Renaissance town hall was destroyed by fire. One year later, the foundation stone of the new town hall was laid and, in 1923, the building was finished according to Gahura's design. Work to create the building’s current appearance was finished in 1936-1937, when it was extended in Bartošova Street. The architect Gahura also designed the sculpture of the blacksmith on the north facade. Opposite the town hall are sculptures of St. Florian and St. Donatus from the 18th century. The representative residence, which stands in a large park, was completed in 1911. Its basic shape was designed and the construction was started by Vizovice builder František Novák. To finish it, Tomáš Baťa hired architect Jan Kotěra, who performed several layout modifications and simplified the design of the exterior. Between 1911 and 1915, the building was supplemented with a series of promenades, arbours, pergolas and a gardener's house, all designed by Jan Kotěra. The garden was designed by the well-known landscape architect František Thomayer. 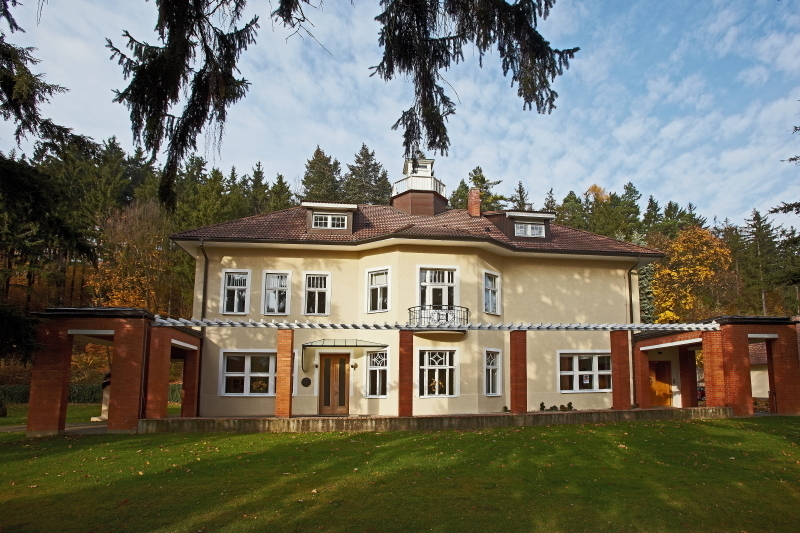 At present, the residence houses the Tomáš Baťa Foundation and is only accessible to large groups of people by prior arrangement. The garden is open to the general public. The residence also hosts various cultural events such as lectures, concerts, May Day celebrations, etc. The history of the chateau dates back to the 15th century. In 1929, the owner, industrialist Tomáš Haupt, sold the chateau to the town. The money for the purchase was donated to Zlín by Mayor Tomáš Baťa. Between 1931 and 1933, a small museum with an exposition of historical and exotic shoes was opened in the chateau. In 1935, the chateau began to serve as the offices of government institutions such as the Zlín District Office, and between 1958 and 2012 it housed a museum, later named the Museum of Southeast Moravia. Today the museum is located in the 14I15 Baťa Institute. The chateau is home today to the Václav Chad Gallery, and other uses are being discussed. The 14|15 BATA INSTITUTE was created by converting two factory buildings in the former Bata industrial zone in Zlín. They were originally designed by architect Jiří Voženílek and built between 1946 and 1949. The industrial buildings bearing the Bata numbers 14 and 15 were recently converted into a modern cultural and educational centre - the Regional Gallery of Fine Arts, the Museum of Southeast Moravia and the František Bartoš Regional Library. The main exposition of the Regional Gallery of Fine Arts in Zlín named Zlín Space features Zlín architecture, the local urban and industrial design, which in fact originated in Zlín. The exhibits also include Bohemian artists of a European calibre from the first half of 20th century, including Alfons Mucha, Emil Filla, Bohumil Kubišta, Václav Špála, Josef Čapek, Jan Zrzavý, Jindřich Štýrský, Toyen (Otto Gutfreund), Vincenc Makovský and others. The permanent exhibition of the Museum of Southeast Moravia named The Baťa Principle: Today's Fantasy, Tomorrow's Reality introduces the history of the Baťa Company from its establishment in 1894 until the nationalization of the Czechoslovak part of the concern after World War II. The exposition also includes collections of shoes and shoemaking machines. There is also an exhibition on the history and present of film-making in Zlín, with an important section dedicated to the travellers' collection - Jiří Hanzelka and Miroslav Zikmund as the most famous, and others. The fifth floor houses an exhibition of František Bartoš, a pre-Baťa Zlín native, a teacher, ethnographer and folklorist. It introduces his life and work, but also offers interactive entertainment for young visitors. Bulding, office in the elevator: every day 8:00 a.m. – 9:00 p.m.
Cafe and observation terrace: every day 10:00 a.m. – 9:00 p.m. The No. 21 administration building of the shoemaking company - the Zlín skyscraper, was one of the first high-rise buildings in Europe. It rightly received the Building of the Century Award together with all of the former Baťa plants. The building, which is 77.5 m tall, was completed in 1938 based on the design by architect Vladimír Karfík. Each level was an open-floor office for 200 people. The service areas (lifts, staircases, restrooms, air-conditioning) were set off the main space. The building is fully air-conditioned, with rapid lifts and a paternoster. The company manager's office and lift is a technical gem; it had an area of 6 x 6 m and was equipped with air-conditioning and a wash basin. If you wish to have a ride, make an appointment at least two days in advance at the Museum of Southeast Moravia (www.muzeum-zlin.cz), which administers the lift. Tubular post and floor electric outlets were standard. Karfík's masterpiece is a national cultural monument of the Functionalist period. After reconstruction, it now houses the Regional and Financial Office. The first department store, today's market hall, with a wing of kiosks that were later demolished, was built in 1927. Besides shops, it housed a dining hall and a cinema. 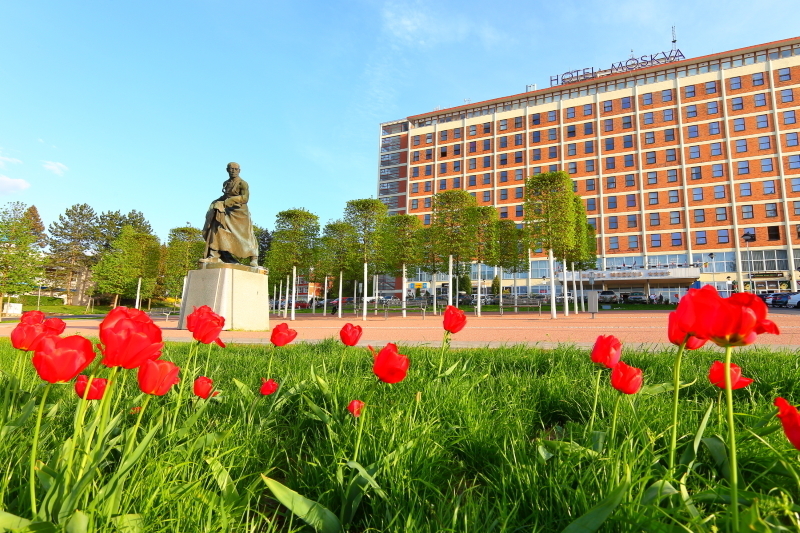 This building was designed and built by the company of A. Jambor, an "authorized civil engineer for architecture and structural engineering in Hranice". The design was the first to employ a reinforced concrete factory frame in public buildings. Five years later in 1932, another nine-storey department store was built near the first building. The architect Gahura was probably involved in the project. In 2017 the extensive reconstruction of the department store began, which lasted 16 months and gave the building its original appearance, typical of which was a particularly unusual division of the windows. Those on the two lowest floors extend from the floor to the ceiling and gradually narrow downwards. The Grand Cinema was originally built as a provisional cinema in 1933. The building was designed by the building department of Baťa, a. s., Zlín. The work is attributed to F. L. Gahura, but his involvement is not documented until the modification of the interior to a theatre in 1939. After completion, the cinema was the first building among the town's cultural facilities intended for mass visits and was designed to hold a remarkable 2,270 people! It was undoubtedly the largest cinema in pre-war Czechoslovakia and probably even in Central Europe. With its simple cube shape, it became an essential part of the square, highlighting the dominant position of the Community Centre on its southern side. The cinema is now closed due to the bad technical conditon! The reinforced concrete frame was built according to the design by architect Miroslav Lorenc from 1931. During the construction, T. Baťa had a falling out with architect Lorenc and ordered two model rooms for the fourth floor - one by architect Gahura and one by architect Karfík. Based on Vladimír Karfík's project, the building was completed in 1933. The eleven-storey building became the main community centre in the town. The first and the second floors house restaurants, cafés, club rooms, play rooms and formal rooms. 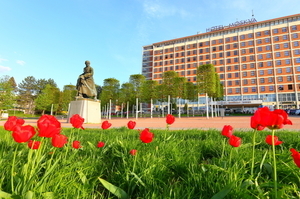 The hotel with 300 rooms can host various social and company events in the congress hall and parlours and also offers a broad range of additional services. A characteristic Zlín quarter. In 1918, Tomáš Baťa began to build houses for his employees based on the design by architect Jan Kotěra. Later, the district was expanded and the well-known cubes with exposed brickwork were added according to the master plan of F. L. Gahura. Between 1912 and 1945, the Baťa Company built 2,210 houses for its employees in Zlín. Besides Letná, the houses are also located in the Zálešná, Podvesná, Lesní čtvrť and Nad Ovčírnou quarters. Built in 1933, Tomas Bata Memorial is known as the most impressive masterpiece of F. L. Gahura, making it to the top of Zlin´s funcionalist architectural gems. The monument has returned to its original look after extensive reconstruction and is now serving its true purpose as commemoration of T. Bata. The interior is characterized by minimalism and simplicity that is corresponding with Tomas Bata´s bright, truthful and unpretentious personality. This vast space is disrupted only by large concrete columns and single staircase leading to a mezzanine and top floor. The only light source of the memorial are copies of 65 unique standing lamps, creating feeling of a bright jewel from the outside. Architect Ing. Petr Všetečka, who is in charge of memorial reconstruction, has kept all features of the original building including model of the aircraft Tomas Bata has crashed in and died. This model is planned to be installed by May 2019. The houses were designed by František Lydie Gahura, and they were finished between 1930 and 1937. The first boarding house was built directly at the factory in 1925, but was demolished in 1965. Construction of a whole mass residential quarter began in 1927. 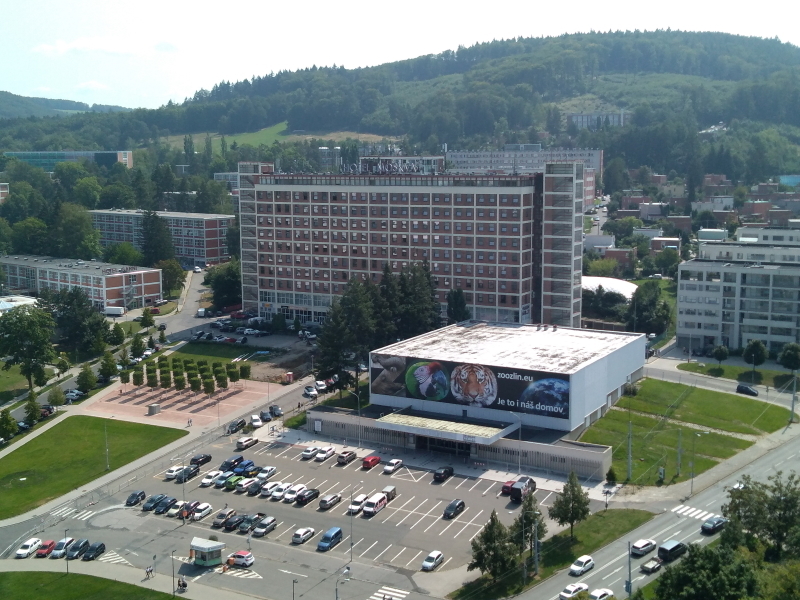 The two rows of free-standing boarding houses and study institutes still create one of the most characteristic Zlín urban complexes, which have no parallel in this country as regards their size and aesthetic value. It has a classic structural concept: a reinforced concrete support system in a layout module of 6.15 x 6.15 meters with outdoor cladding of grouted brick. Today the boarding houses have been partly reconstructed and serve as shops, restaurants, offices and are partly used for accommodation. The Zlín Cultural and University Centre, which was designed by the well-known Zlín native and architect Eva Jřičná, is one of the Zlín's dominant landmarks. This light and airy structure of the multifunctional building forms a unit with the chancellor’s office of Tomáš Baťa University. The history of the complex comprising two separate blocks of the Zlín Congress Centre and the Zlín University Centre started in 2003. At that time, it was decided that instead of copies of original buildings, a different structure should be built in the area of the defunct Masaryk schools. However, it was conditioned on the preservation of the original urban principle of the buildings' layout in the letter Y and their connection with the town centre. Preparatory work began in the autumn of 2005 and the foundation stone was laid in June 2006. The university centre, which houses a scientific technical library and Tomáš Baťa University chancellor’s office, was finished first in 2008. The congress centre, the seat of the Bohuslav Martinů Philharmonic Orchestra, was ceremonially opened at the end of 2010. Since 1 January 2011, this modern multifunctional building has hosted concerts, symposiums, exhibitions, balls, conferences and other events. Between 1945 and 1950, a twelve-storey building was built according to the design by architect Jiří Voženílek in the centre of the town. It represented the first attempt to build a new form of housing. The high-standard apartments were equipped with artificially lit and ventilated kitchen boxes located, like the other equipment, inside the layout. A restaurant and club rooms were located in the basement and a gym was situated on the recreational terrace. A nursery school and a kindergarten are located in a special ground-floor wing accessible through the building's basement. A new cultural institute called Alternativa with an area of 270 m2 was opened in the bottom part of the former university cafeteria in September 2003. The facility hosts concerts, lectures, public readings, poetry evenings, video projections, public discussions, exhibitions and educational activities. The professional theatre was established in Zlín in 1946. In the beginning, it was located in the Small Theatre in Štefánikova Street. The Municipal Theatre, formerly the "Workers' Theatre", was built as the first theatre in Czechoslovakia after the war. It was finished in 1967 according to the design by architects M. Řepa and F. Rozhon. The capacity is 800 people. At present, the Zlín Municipal Theatre is regarded one of the top-quality regional dramatic theatres in the Czech Republic. In addition to its own repertoire, it offers numerous performances by visiting theatres. In early May, Zlín hosts the international Setkání - Stretnutie (Meeting) theatre festival. The theatre’s backstage area is open to the public several times a year during open houses. One of the most significant historical landmarks of the Zlín Region lies only 6 km from the centre of modern Zlín. The castle was established by John Henry, the Margrave of Moravia, in the second half of the 14th century. Over the following centuries, it underwent several reconstructions which transformed the original Gothic mediaeval castle into a Renaissance chateau, later modified in the Baroque style. The castle kept its residential and administrative function until the mid-20th century. It was owned by a number of noble families (e.g. the Tetours of Tetov, the Liecthenstein - Kastelkorns, Salm - Neuburgs); the last owners were the Šternbergs between 1804 and 1945. In 1953, Malenovice Castle became the property of the newly established regional museum, today the Museum of Southeastern Moravia in Zlín. Part of the castle is open to the public, visitors can tour the castle interiors (the so-called “Painted Hall” with a Late Gothic vault and preserved inscriptions from the first half of 16th century, a chapel with murals from the mid-18th century, equipment of the Malenice manor office, etc.). The castle tower is also open to the public. During the visiting period, Malenovice Castle hosts concerts, theatrical performances, night tours, special tours for children and historical fencing performances. The Observatory is located in the Zlín Grammar School area. In addition to exploring the sky, you can hear lectures and view a variety of exhibitions. It is possible to arrange a programme on a selected theme for groups and schools. The Lazy area is dominated by the "Burnt Oak" gazebo. The trails are lined with benches, resting areas and panels that inform tourists about local ornithological research, the proposed method of forest management according to the approved plan, etc. The wooden structures have a natural character that fits in well with the local landscape. The Health Trail, built on the property of municipal forests below Tlustá hora Hill, offers opportunities for active leisure time to citizens of our town and other people - jogging, cycling, children's games, bodybuilding, physical workouts, family trips and outings. The "central area of the health trail" with an atypical forest gazebo, a suspension bridge, five stations with exercise equipment (horizontal bar, parallel bars, wall bars, slide, children's jumpers, etc.) is accessible by several marked trails: from Letná - Pod Rozhlednou St., from Pod Majákem district, from Prštné - Nerudova St. and from Podhoří - U Slanice St. Information panels will help you find your way. Animation workshops, floor about history of movie in Zlín, floor for children. In the building 32 there is also a special exhibition about history of movie in Zlín - it is called Kabinet filmové historie. Designed by MUDr. Rudolf Gerbec (the idea, concept and principle of the cemetery) and František Lydie Gahura (the project, two crosses, Baťa family tombstones, etc.). The cemetery was completed in 1931. The authors sought to preserve the high-quality natural environment. The character of all artistic elements, especially tombstones, was subjected to this idea - it was not to be pompous, monumental or made of showy materials. Only the main cemetery road was built. The groups of graves were accessible only by forest trails. The first person buried at the site was Grebec's son, followed by factory founder Tomáš Baťa (14 July 1932) and his pilot Jindřich Brouček. Opening hours: 1. 11. – 30. 4. 8:00 a.m. – 6:00 p.m.; 1. 5. – 31. 10. 7:00 a.m. – 8:00 p.m. 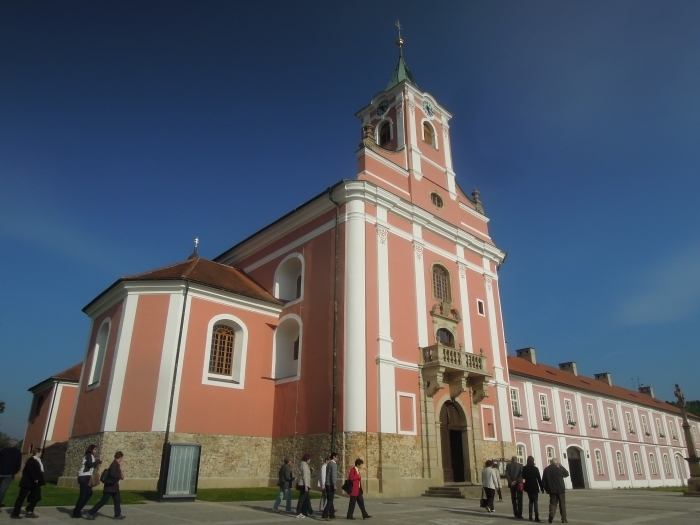 The Baroque Church of the Birth of the Virgin Mary from the 18th century is a Marian pilgrim site. It is the largest and most beautiful church in the area. The Štípa organ is one of the largest and most superior works by František Čapek and Max Zachistal of Krems. The church is opened thirty minutes before services and about fifteen to thirty minutes afterwards (the current list of services), or by prior arrangement (contact at www.stipa.cz). Between 1. 5. and 30. 9., i.e. the "open gates" period, it is open daily except on Mondays from 10:00 a.m. until 5:00 p.m., on Sunday from 1:00 p.m. to 5:00 p.m.